She's such a tiny thing and she's just learning to fly, but Fairy Princess Bea has made a slight miscalculation in trying to fly into the tiny birdhouse! Baby Bea is all dressed up in her tiny hand made silk dress and bloomers and matching silk bonnet. Her dress and bonnet are lacy and are adorned with pink silk flowers. Her tiny wings are hand drawn and hand painted with pink glitter. 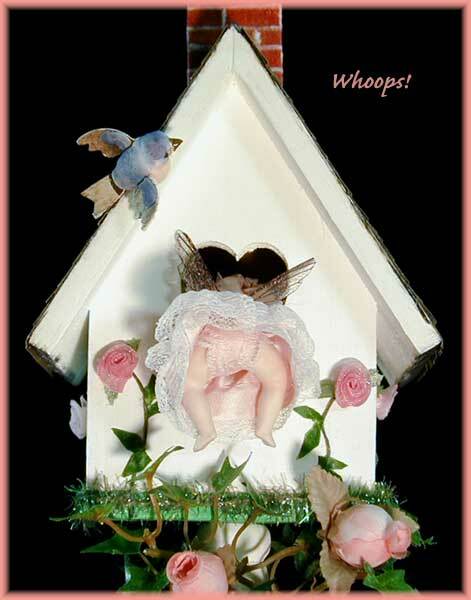 The birdhouse is hand painted and is decorated with ivy and roses, with silk roses on the house itself. Baby Princess Bea can be posed flying into the birdhouse or sitting at the base. With care, she can even be posed inside the house, leaving the little silk ribbon hanging outside as an aid to anchor her or to remove her. What do you suppose the tiny birds are thinking? 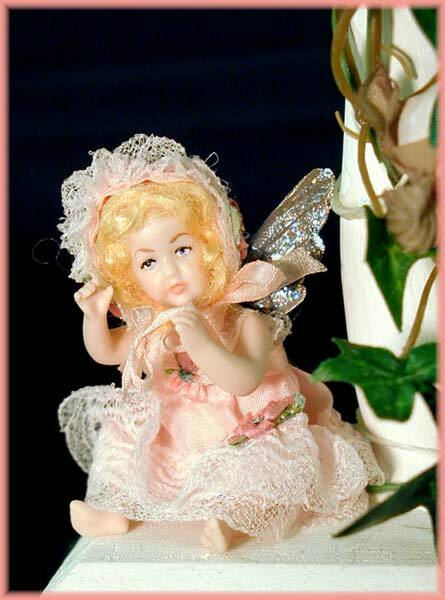 Bea is a hand painted porcelain miniature fairy doll, about 23/4" tall from head to foot. Her wingspan is about 13/4". The birdhouse is 111/2" tall and 4" wide. A beautiful one-of-a-kind work of art by the artist JoAnnJ of Galleria d'Juliani. She is hand signed by the artist.